Organisations invariably seek to improve their understanding of how they work and how effective past investment strategies have been. To access the Usage Dashboard and view stats on usage, click the agileChilli logo, which will load two links. 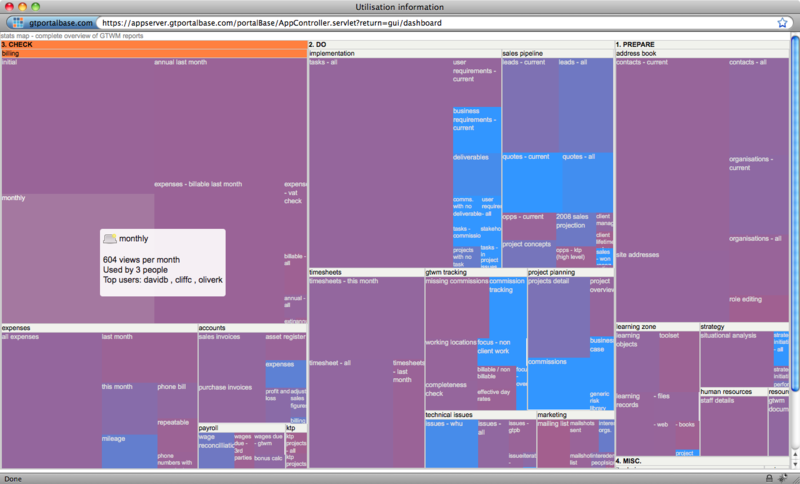 Click on ‘Usage Dashboard’ to load the tree map and sparkline dashboards. In service industries staffing costs are often an organisation’s biggest outgoings. Managers need simple quick ways to understand where this resource is focussed. IT systems underpin performance. Before deciding whether to commit any further resources, IT managers need an overview of how current systems are being used. As an agile development platform, agileBase lets you prototype or build new modules, reports and applications at a rapid rate. agileBase now lets you see what’s functionality is being used within the product, who is using it and how regular this usage is. Equally it lets you see the functionality that has not gained traction. A new ‘info’ button loads a stunningly simple fullscreen ‘map’ of all the areas of an organisation. Each report or view is a section of the screen – big areas for those that get a lot of use, smaller for those that don’t. Colours give immediate feedback on whether it’s usage is increasing (red = hot) or decreasing (blue = cooling). Hovering over an area shows more stats including the top users. As one user said, “If I have understood you correctly you monitor the actual use of information? That seems like a very good idea to me as it is one of the ways to find out what information (in the system) actually matters most to the organisation. That really helps setting priorities for future development”. 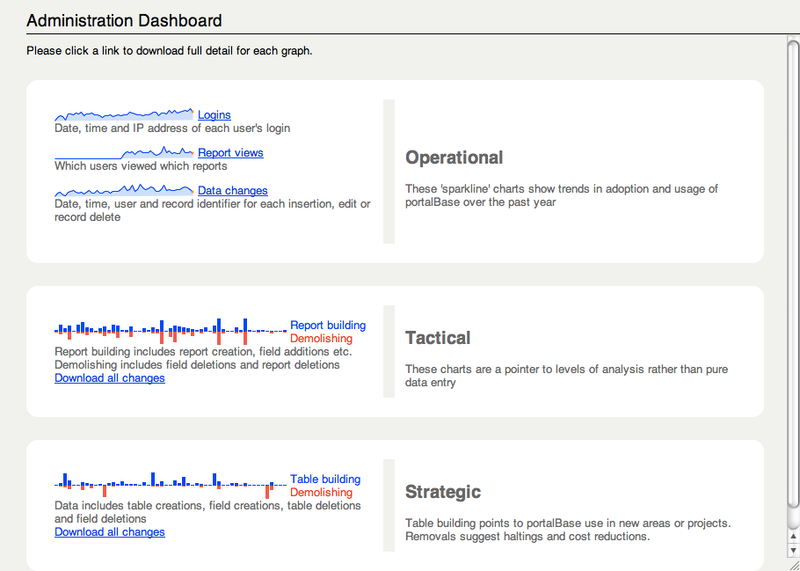 ‘Sparkline’ graphs that use log statistics to highlight particular types of usage in three areas – operational, tactical and strategic.